Known for his lyrical as well as his strong modern, versatile, and adventurous approach to trumpet playing, Jacques Kuba Sequin is a player who likes to shake up his sound with different outfits. He was born and raised in Montreal, so fits well into its multi-ethnicity. Inspired by his various collaborations with companies like Cirque du Soleil and various pop and classical artists, Jacques breaks out from jazz tradition to create the urge for improvisation inside his ensembles. In symbiosis with the expressive bass player Frédéric Alarie, Jacques finds new ways to use the sound of the trumpet as rarely heard before by presenting a program that swings between modernity and tradition. 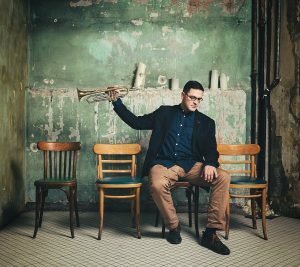 Always reaching for his Polish roots, this Canadian trumpeter and composer is turning heads and gaining more and more recognition on the Canadian scene. The winner of the 2012-13 Révélation Jazz Radio- Canada prize, in 2015 & 2016 Jacques was nominated at l'ADISQ in two different categories: best arranger and best jazz album of the year for his record “L’élévation du point de chute”. With that same record, Jacques was also nominated for a 2015 & 2016 Opus prize 2015 in the category “Best jazz record”. While each member of the band plays creatively and delivers one blockbuster solo after another, Séguin’s writing steals the show. The musical content between the tunes (and even within each tune) has wide variety and Séguin takes advantage of the many combinations of instruments in the band available to him.